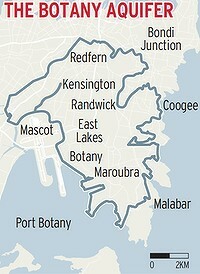 Clover Moore's Sydney city council seems to be plotting a slow secession from the electricity and water grids. The SMH has a report on an interesting plan for storing recycled water in local aquifers - City of Sydney plans recycled water network. THE City of Sydney council is finalising plans for a recycled water network to be established throughout much of the city. It will include use of the Botany aquifer which extends from Redfern and Surry Hills, through Centennial Park and on to Botany Bay. The rethink of the city's water supply comes as the council finalises plans to decouple the electricity network from the statewide supply grid, instead using a new network of power generators throughout the CBD which will provide cheaper and more reliable power to the city. ''If you're digging up the streets to put in the new trigeneration [electricity, heating and cooling] system, that's the golden opportunity to put in a recycled water network,'' the council's chief development officer for energy and climate change, Mr Allan Jones, said. The council recently outlined plans for an automated waste collection system, which remains under study. ''Piping water into the city and only drinking 2 per cent of that is just crackers,'' Mr Jones said. Taking into account cooking, and any possible way of ingesting water, no more than 20 per cent of the city's water needed to be of drinking quality, he said. Central to the plan will use of recycled water and stormwater at new developments such as Barangaroo and Green Square. Barangaroo will generate a surplus of recycled water which is expected to be used in water cooling towers and similar structures in other parts of the CBD.